Unemployment rates rose last month in Vermilion and some neighboring counties. Preliminary new numbers show Vermilion County’s jobless rate rose from 5.5 percent in November to 6.4 percent in December. In Danville the unemployment rate rose from 6.3 to 6.6 percent. Danville and Vermilion County were not the only areas where jobless numbers rose. In Champaign County the unemployment rate climbed from 4.1 percent in November to 4.4 percent in December. Edgar County’s jobless rate went from 4.6 to 5.2 percent, and in Iroquois County the unemployment rate was 5.3 percent in December – compared to 4.2 percent in November. 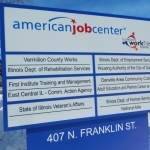 Vermilion County’s December unemployment rate of 6.4 percent compared to 5.7 percent in December of 2018. The report shows Non-farm employment increased over the year by 100 in Vermilion County. Job gains were reported in Education and Health Services – up 200 from a year ago, along with the Leisure & Hospitality…Wholesale Trade, and Transportation, Warehousing and Utilities sectors which each gained 100 employees from levels a year ago. The Government sector in Vermilion County lost 200 jobs over the year…Retail Trade dropped by 100, and there were 100 fewer workers in the Information sector in December compared to last year. The numbers were released by the U.S. Bureau of Labor Statistics and the Illinois Department of Employment Security.